The Centers for Medicare and Medicaid Services is rolling back regulations around rate increases, essential health benefits, health insurance navigators, and more, for insurers offering Qualified Health Plan coverage on the Health Insurance Marketplace in 2019. Consumer cost-sharing limits will increase by 7 percent. 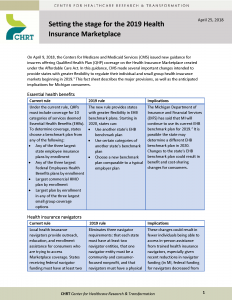 These changes will impact Michigan consumers as soon as November 1, 2018, when the next Marketplace Open Enrollment Period begins. For more about silver loading, individual mandate hardship exemptions, risk adjustment rules, and other regulatory changes, click on the image above.